Mego changed the face of Action figures during their juggernaut run in the '70s. One of the best, if not THE best, lines that Mego created during this time is the Flash Gordon series. Like many of Mego's other lines, the series featured only 4 figures; Flash Gordon, Dale Arden, Dr. Zarkov, and Ming the Merciless. All four were 9" in height and loaded with accessories. Vibrant costumes, with Mego's known eye for detail gave these dolls a real 1930's retro feel. 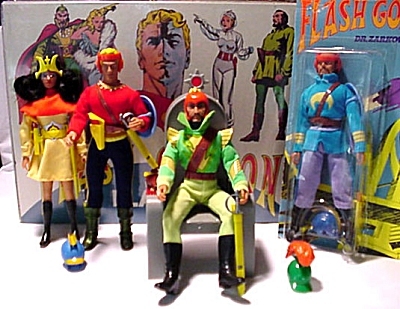 A two-in-one playset accompanied the Flash Gordon figures. On one side it was Dr. Zarkov's Laboratory, and on the other - Mings throne. The vinyl playset was a perfect fit for the figures with it's adornment of retro art, mixed with sci-fi graphics. It is difficult to find Flash Gordon figures on card. Expect to pay between $60.00 and $150.00 for mint figures on the secondary market. Flash and Dale seem to be more common than Ming, while Dr. Zarkov is the most difficult to find. Loose figures are very challenging to find complete. In fact, most collectors will go for rough carded pieces just to obtain all the accessories for the dolls. Only one variation is known to exist in this line. Flash was briefly packaged with deep green metallic boots, instead of the common black. This is very rare! If you collect Megos, or plan to start, be sure to make room for these imaginative and artistic examples of '30s science-fiction villains and heroes.